This study demonstrates that further research is required to devise different methods of coating TiO2 on the properly polished surface of denture base resins. A total number of 50 standardized circular disc samples of PMMA were prepared from heat-cured acrylic resin (DPI, Mumbai, India). The powder-to-liquid ratio was 2:1 by volume. The resulting mixture was packed into a plaster mold (20-mm diameter and 2.0-mm depth) and immersed in water at 60°C for 60 min (for primary polymerization) and then in boiling water for 60 min (for secondary polymerization). The cured samples were smoothened up to the same grit, [Figure 1]. The samples were stored in different containers containing 50 ml (10 ml per sample) of the test solutions [Table 1] for 10 min (average time for which a beverage is consumed during the day), followed by storage in distilled water daily for 56 days. 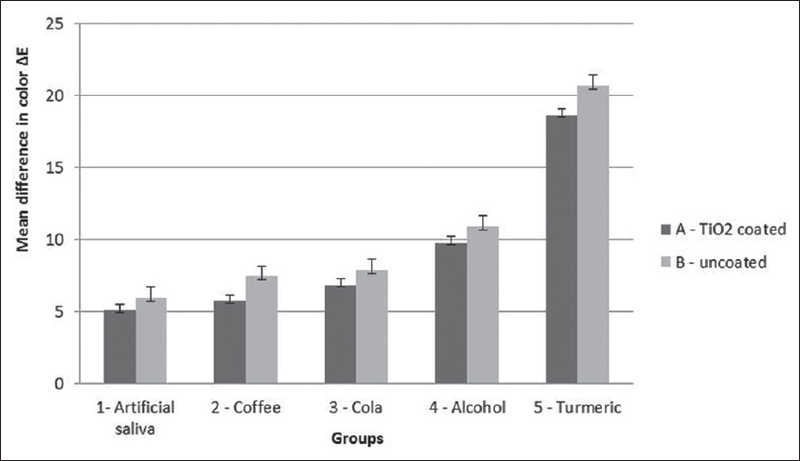 It is stated that exposure of acrylic to different beverages for a minimum of 56 days is required to bring about a clinically perceptible color change [Figure 2]. The mean differences in color values are shown in [Table 2], and [Figure 3] and [Figure 4] show the samples after storage of 56 days. Goiato MC, Zuccolotti BC, Moreno A, dos Santos DM, Pesqueira AA, Dekon SF, et al. Colour change of soft denture liners after storage in coffee and coke. Gerodontology 2011;28:140-5. Imirzalioglu P, Karacaer O, Yilmaz B, Ozmen Msc I. Color stability of denture acrylic resins and a soft lining material against tea, coffee, and nicotine. J Prosthodont 2010;19:118-24. Hong G, Murata H, Li Y, Sadamori S, Hamada T. Influence of denture cleansers on the color stability of three types of denture base acrylic resin. J Prosthet Dent 2009;101:205-13. Goiato MC, Dos Santos DM, Baptista GT, Moreno A, Andreotti AM, Bannwart LC, et al. Effect of thermal cycling and disinfection on colour stability of denture base acrylic resin. Gerodontology 2013;30:276-82. Mori K, Tsuji M, Ueda T, Sakurai K. Color and gloss evaluation of titanium dioxide coating for acrylic resin denture base. J Prosthodont Res 2015;59:249-53. Kado D, Sakurai K, Sugiyama T, Ueda T. Evaluation of cleanability of a titanium dioxide (TiO2)-coated acrylic resin denture base. Prosthodont Res Pract 2005;4:69-76. Arai T, Ueda T, Sugiyama T, Sakurai K. Inhibiting microbial adhesion to denture base acrylic resin by titanium dioxide coating. J Oral Rehabil 2009;36:902-8. Amano D, Ueda T, Sugiyama T, Takemoto S, Oda Y, Sakurai K, et al. Improved brushing durability of titanium dioxide coating on polymethylmethacrylate substrate by prior treatment with acryloxypropyl trimethoxysilane-based agent for denture application. Dent Mater J 2010;29:97-103. Tsuji M, Ueda T, Sawaki K, Kawaguchi M, Sakurai K. Biocompatibility of a titanium dioxide-coating method for denture base acrylic resin. Gerodontology 2016;33:539-44. Bansal K, Acharya SR, Saraswathi V. Effect of alcoholic and non-alcoholic beverages on color stability and surface roughness of resin composites: An in vitro study. J Conserv Dent 2012;15:283-8. Guler AU, Yilmaz F, Kulunk T, Guler E, Kurt S. Effects of different drinks on stainability of resin composite provisional restorative materials. J Prosthet Dent 2005;94:118-24. Harini P, Mohamed K, Padmanabhan TV. Effect of titanium dioxide nanoparticles on the flexural strength of polymethylmethacrylate: An in vitro study. Indian J Dent Res 2014;25:459-63. Okubo SR, Kanawati A, Richards MW, Childress S. Evaluation of visual and instrument shade matching. J Prosthet Dent 1998;80:642-8. Um CM, Ruyter IE. Staining of resin-based veneering materials with coffee and tea. Quintessence Int 1991;22:377-86. Brewer JD, Wee A, Seghi R. Advances in color matching. Dent Clin North Am 2004;48:v, 341-58. Seghi RR, Hewlett ER, Kim J. Visual and instrumental colorimetric assessments of small color differences on translucent dental porcelain. J Dent Res 1989;68:1760-4. Guler AU, Kurt S, Kulunk T. Effects of various finishing procedures on the staining of provisional restorative materials. J Prosthet Dent 2005;93:453-8. Chen Q, Yakovlev NL. Adsorption and interaction of organosilanes on TiO2 nanoparticles. Appl Surf Sci 2010;257:1395-400. Nazirkar G, Bhanushali S, Singh S, Pattanaik B, Raj N. Effect of anatase titanium dioxide nanoparticles on the flexural strength of heat cured poly methyl methacrylate resins: An in-vitro study. J Indian Prosthodont Soc 2014;14:144-9. Zakir M, Ashraf U, Tian T, Han A, Qiao W, Jin X, et al. The role of silane coupling agents and universal primers in durable adhesion to dental restorative materials – A review. Curr Oral Health Rep 2016. [Doi: 10.1007/s40496-016-0108-9]. Ahmed MA, El-Shennawy M, Althomali YM, Omar AA. Effect of titanium dioxide nano particles incorporation on mechanical and physical properties on two different types of acrylic resin denture base. World J Nano Sci Eng 2016;6:111. Hamouda IM, Beyari MM. Addition of glass fibers and titanium dioxide nanoparticles to the acrylic resin denture base material: Comparative study with the conventional and high impact types. Oral Health Dent Manag 2014;13:107-12.